Notepad is the barest of bones plain text editor you can get for Windows, and that’s why so many of us love it or hate it. Although I’ve long since moved on to the free feature-packed Notepad++, many still use good old Notepad as their primary text editor. Notepad has been bundled with Windows ever since Windows 1.0 launched in 1985 and it’s only evolved slightly. 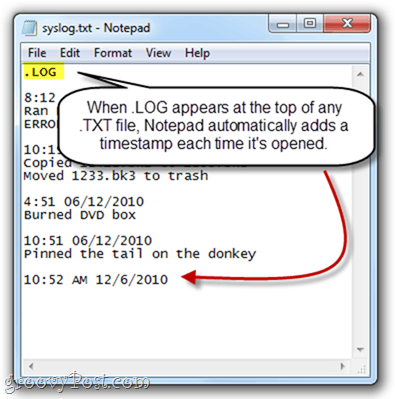 But after decades of use, there are a few groovy features hidden in Notepad that you may have never known existed. Check them out. 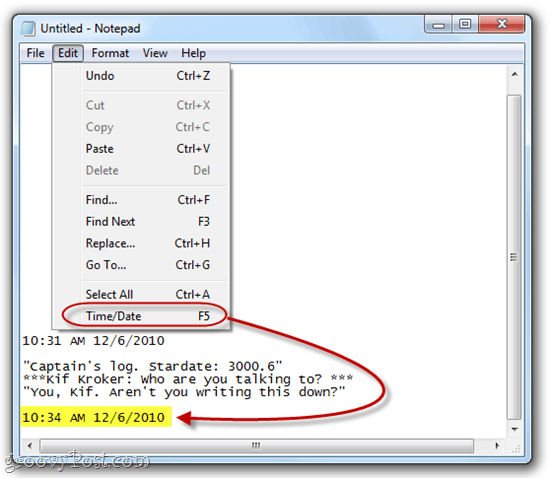 Press F5 or choose Edit and Time/Date to insert the time and date automatically into Notepad. Handy for all those captain’s logs you’ll be keeping on your next starship journey. Right-click in Notepad and choose Right to Left Reading Order to change the way the text is displayed. This is useful if you’re typing in a language that is read from right to left, such as Arabic or Hebrew. As you’ll notice from the screenshot, it only reverses the order of the letters and words if you are typing in a language that reads from right to left. For English, it arranges it much as if it were right-aligned, except the punctuation ends up on the left side of the line. Create a new .txt file and at the very top of the first line, insert: .LOG. 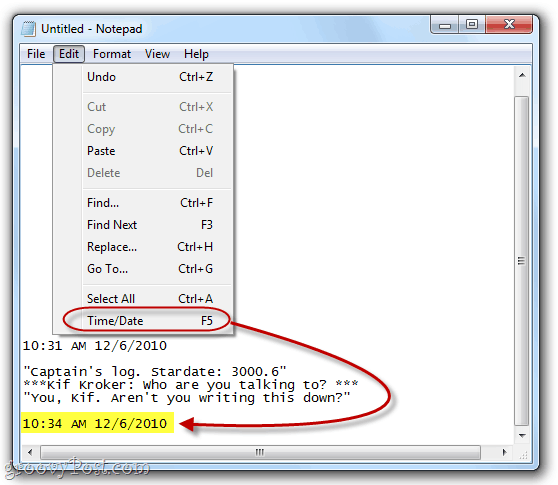 Now, whenever you open the file in Notepad.exe, Notepad will automatically insert a timestamp on the next line. This is handy if you have scripts or other automated network tasks where a log file is created. 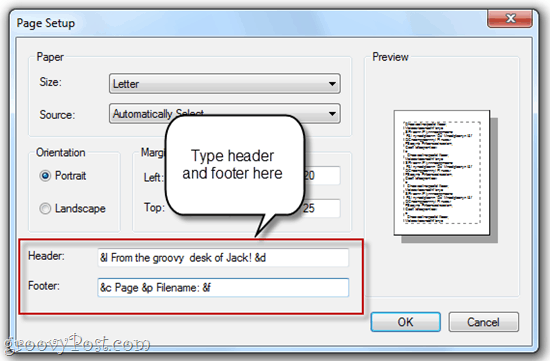 Notepad doesn’t have the rich text editing features of bona fide word processors, but you can still add a header and footer to each page for printing. To do so, click File and choose Page Setup. Here, you’ll see the Header and Footer boxes. You can enter plain text here, or special characters which automatically insert the date, time, page number and other information. 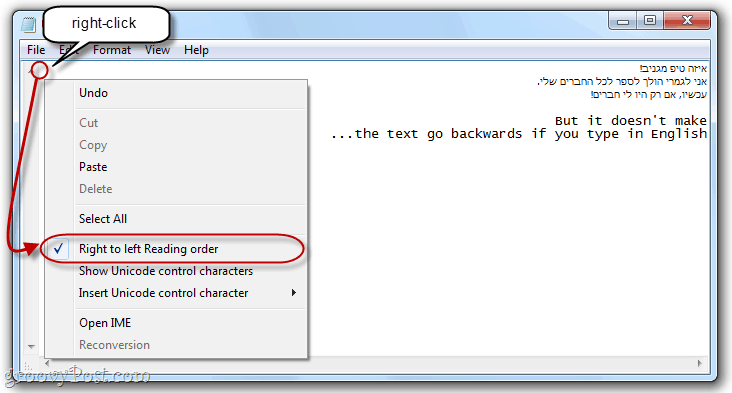 Press CTRL-G or click Edit and choose Go To… to jump to a specific line in the text document. 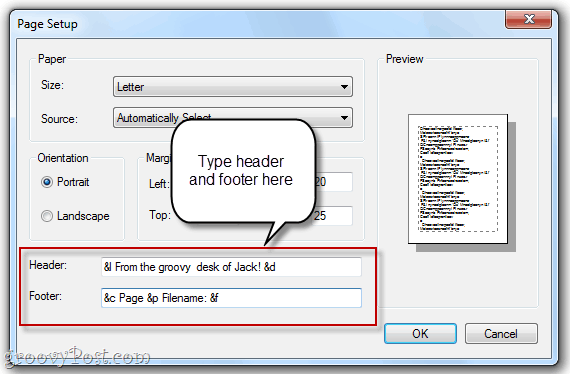 Note that you must have Word Wrap turned off (click Format and choose Word Wrap) for the Go To… feature to work. 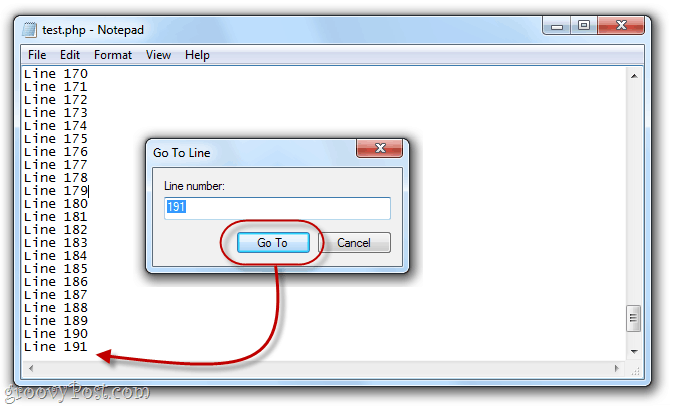 You don’t need to number your lines for this to work, and if you do, Notepad will just go by its numbering, with the first line number as 1, the second as 2 and so forth. 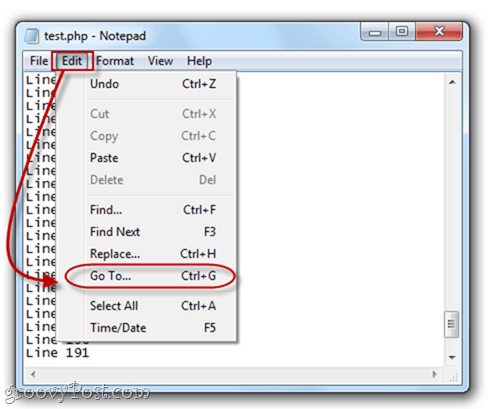 This might be helpful if you’re using Notepad.exe to code or script, and your browser spits out an error such as “Syntax error on Line 642.” You can then open up Notepad.exe, hit CTRL-G and type in 642 and automatically be taken to the offending line of code. That’s much easier than counting them by hand. Also, note, that when you first hit CTRL-G, the number in the field will be the current line number, which his helpful for keeping track of where you are in your text document. 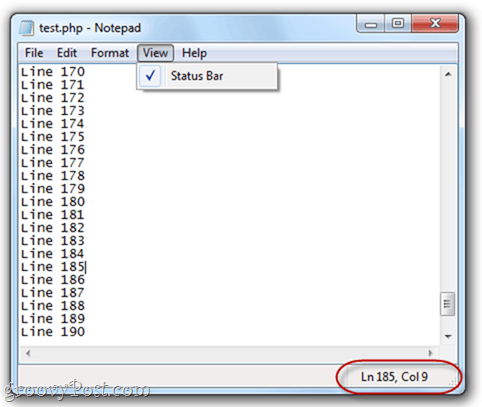 You can also see the Line and Column number by clicking View and choosing Status Bar. So, there you have it—Notepad.exe does more than you thought it could. 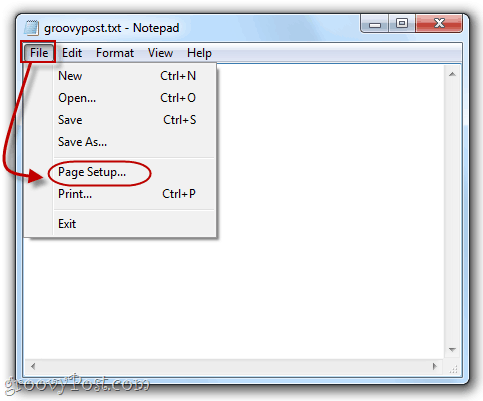 While this might not elevate it to the full-featured level of programs like Notepad++, these groovy tips can save you some time if you prefer to stick with Notepad.exe for your plain text editing endeavors. So thats why everytime I open notepad, it seems as if it does not open a blank pad. Did not know about no 3, but I think the logging option is totally useless. And by the way, the tip #2 can be applied to all system edit controls. Very cool, I love the .LOG, never knew about this one. You want some easter eggs? Try holding the Alt while typing in a 3 or 4 digit number with the numpad. After releasing Alt you will insert a symbol into your document. Also, I remember a while ago there was a trick with a certain update on Windows XP SP2 that would trigger opening a hidden system file if you do a few complicated steps. I can’t find it now, though. I still assure you this is 100% true since I witnessed it with my own eyes when a friend showed me this on his own machine. Then save it as “computer.bat” and open it. Two lines of code and you get a fireworks show in your computer, pretty neat right? Man Pasta! I had a download going on man! you ttally ruined it. I was waiting for over an hour! How do I keep Notepad from switching writing order? About half the time I find my texts almost unreadable because Notepad has switched from left-to-right to right-to-left with only a tone as a warning. It is extremely annoying. Nice tricks. I was just looking for the log-option but did not remember the “.LOG”. Also the otehr tips will be useful at times. Thanks. @sicarus: Do you really get through all menu options of a programme to find out if there is something to might need, though not in this very momemnt?